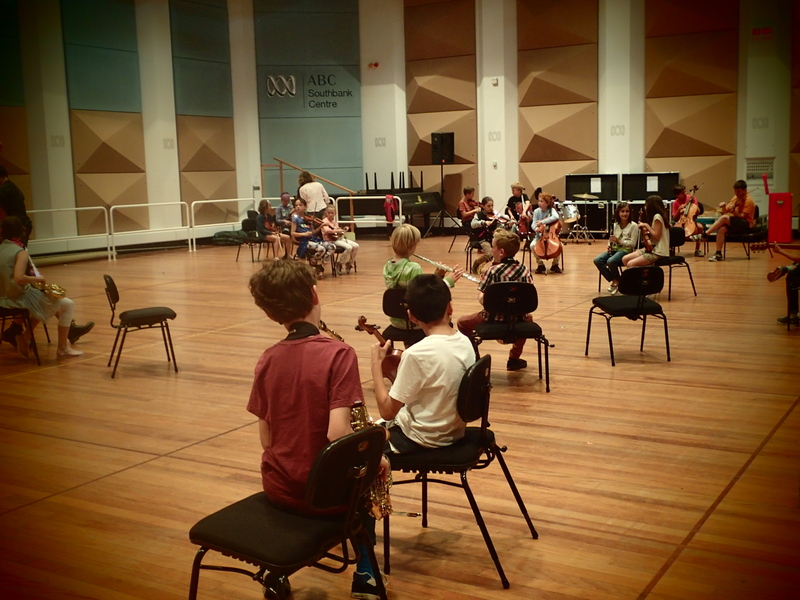 I’ve just got home from leading family workshops for the West Australian Symphony Orchestra’s Beethoven Festival. I led two projects – Beethoven’s Big Day Out, and a Jam on the Ode to Joy. Jams for families on big orchestral works are a core part of my creative work and musical direction, but I was particularly thrilled to get to present Beethoven’s Big Day Out for WASO. It’s a project that has developed through a number of other projects, and it’s interesting to reflect how it evolved through these influences. Beethoven’s Big Day Out has its origins in a Jam for Juniors I led for the Melbourne Symphony Orchestra in 2011, but that project employed ideas that I’d begun exploring in response to the very beautiful, detailed, and insightful work for pre-school children by Pocketfool Productions, and in particular a project that Jennifer Anderson from Pocketfool and I developed together for ArtPlay earlier in 2011 – the Camel Caravan (read about it here). 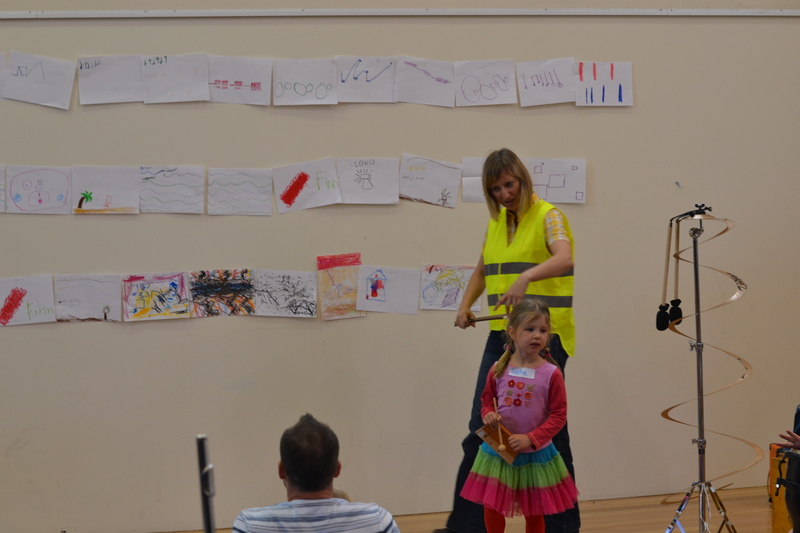 Working with Jen really changed my thinking about approaches to creative music work with under-5s. When we were developing our workshop, Jen talked about how she wanted to try and create language and opportunities around listening, and deliberate choices about sounds. We discussed how transformative that shift from a very self-focused, blocking-out-others way of playing to a more alert, aware, connected experience could be, even for very young players. 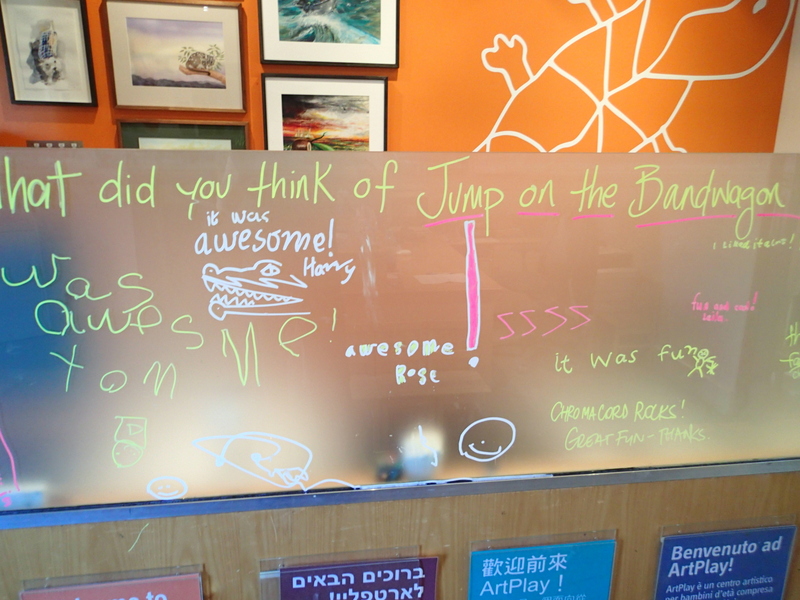 It was a beautiful project, with a big range of musical experiences for the children. In one lovely activity, children could “buy” sounds in a musical market place. They had to think about what kind of sound (a big sound, a shiny sound, etc) that they wanted, and then, after paying their money, they would play an instrument that made that sound. This idea of careful, considered listening and choices then became central to the planning for the first Jam for Juniors with the MSO. I was a bit skeptical about the whole Jams for Juniors concept at first. There would be 50 little children, with their parents, in a large open space, with instruments. How could we get them all creating as well as playing, while ensuring musical integrity and variety, and not have everyone leave at the end of the 30 minute jam feeling assaulted by the cacophony? The idea of a “journey”, which we’d used in the Camel Caravan, was a useful frame, so I utilised it here. Journeys require us to undertake different tasks. There is a sense of adventure and imperative about the different stages of the journey too. A journey through an imaginary environment gets the children’s creativity firing from the outset. That first Jam for Juniors was strong. It involved way too many props to be practical (we changed multiple instruments and props five times in the half-hour workshop), but it offered a big variety of ways of engaging with music and instruments, all while introducing the music of Beethoven to the children and their parents, using themes from Symphony No. 6, the Pastoral Symphony. Two further projects grew out of that Jam for Juniors experience, and both have become ‘flagship” projects for me in my stable of projects to offer to orchestras and arts centres around Australia and internationally. One is Nests (which I’ve written about here) and the other is Beethoven’s Big Day Out. So what has changed in this most recent evolutionary phase? The bones of the original Jam for Juniors are still there. It is still a jam for under-5s, although we’ve narrowed it to an age range of 2-5 years. I’ve incorporated more opportunities for the children to get “up close” to the musicians from the orchestra and their instruments, so that they can feel the physicality and voice of the instruments, and the air vibrating in response. I’ve adjusted the language I use to introduce the different stages of the journey (adjusting and refining language is an ongoing process. It’s an aspect of workshop leading and facilitating that constantly fascinates me). And I removed quite a lot of the props! (Now we only have three changeovers). 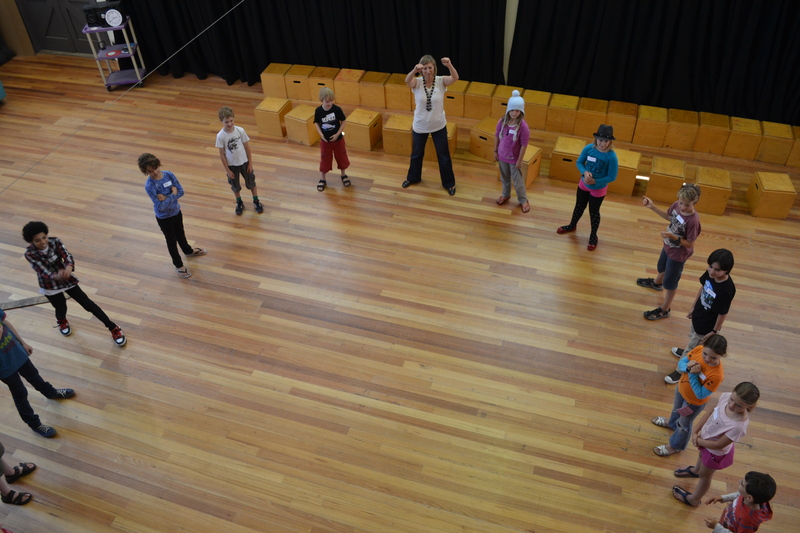 An action shot from the Body Percussion storm! All ready for the first group of journey-makers! The next thing I’d like to create is a ‘travelling’ version of Beethoven’s Big Day Out, where the participant group moves through different sites (such as a series of foyer spaces in a large performing arts centre) as part of the journey. If that sounds like something you’d like to present, let me know! 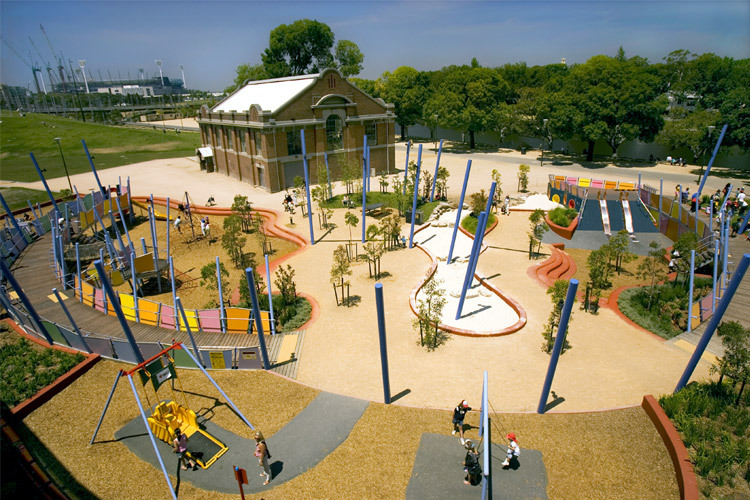 But regardless of the site, Beethoven’s Big Day Out is a very imaginative, movement-filled, multi-sensory experience of a symphony orchestra, its music, and its sounds, that involves all of the children as participants in the music-making in many different, creative, and exhilarating ways. 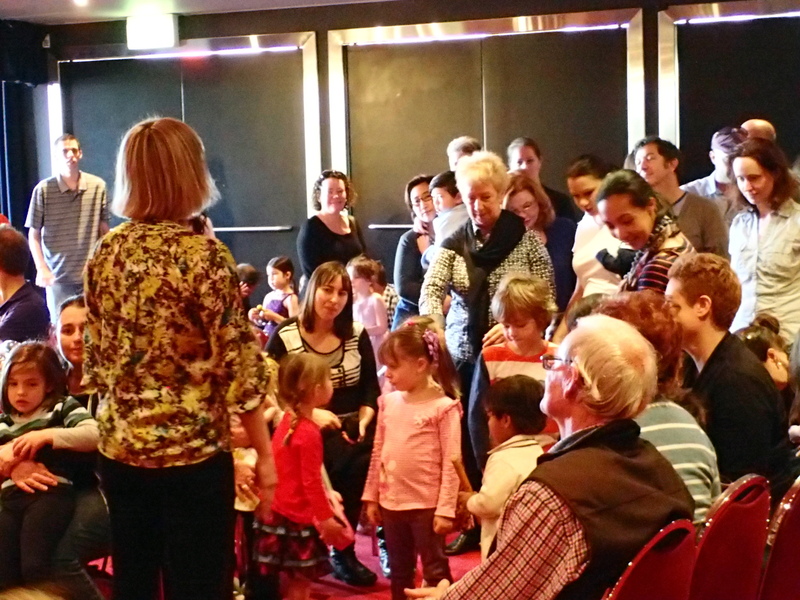 The singing, chattering voices, and bouncing little bodies in the foyer afterwards, and the smiles on parents’ and musicians’ faces, were testament to that. Last weekend ArtPlay presented and hosted a wonderfully stimulating 2-day event – Engaging with Quality, a ‘learning exchange’ for Teaching Artists (artists who work with young people and communities, often in informal or non-formal contexts) that examined diverse approaches to practice. One approach was through demonstration and observation. 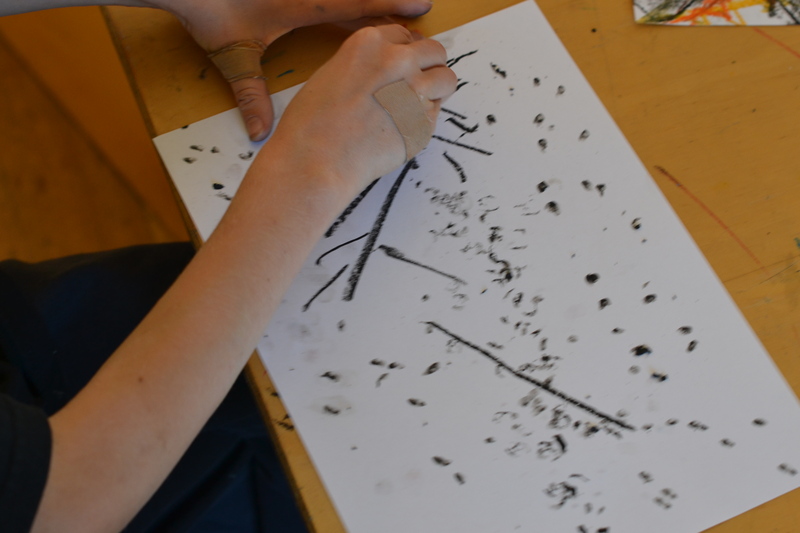 Another was through hands-on experiences of artist workshops, accompanied by explanation of the thinking behind the approach. The weekend also included group discussions and presentations, including a summary of a potential framework, called ‘The Qualities of Quality” that could inform planning, reflection, and evaluation of projects. We were invited to present Nests as part of the two-day program. Parents booked tickets for their 3-5 year olds in the usual way, and delegates sat around the edge of the darkened Nests space, and observed the 30 minute ‘immersion experience’ that the young children and their parents have when they explore the Nests and play the instruments that they find. Following each session there was a discussion with the delegates about what they’d noticed – noticed in the children’s responses, in the parents’ responses, in the musicians’ responses, and in the way the entire environment worked in sympathy (or not) with the participants. We were deeply gratified and moved by people’s responses – we were given so much extremely positive feedback about Nests! It has been a beautiful project to develop, and the three of us in the creative team have felt confident that we have created something very special; nevertheless, it was wonderful to get so much positive feedback, and have all those people’s experiences of Nests reflected back to us. I also got to take part in other artists’ workshops. It was very difficult to choose which workshops I wanted to do – I opted for a stencil-making workshop with Daniel from Junkyprojects first. This was so much fun. I have long been fascinated by stencil art and print-making, as I love the idea of creating something that is reproducible, and that is accessible art, easily shared. I created my first ever stencil. What to draw? As you can (hopefully) decipher below, I created an image of an alien, peering over the top of a brick wall. 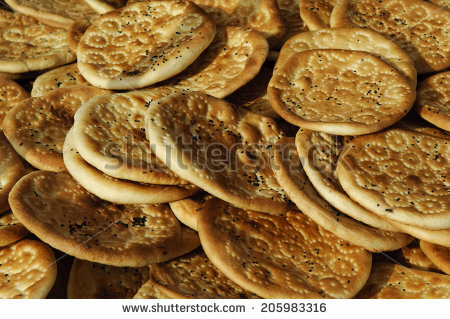 I have no idea why this was the image I thought of. But there you go. Figuring out which bits to cut out (“windows”), and which bits would be the “bridges” that made sure the stencil would hold together with all of its detail, was an interestingly abstract mental process. I could feel my brain going into momentary ‘hangs’ and ‘freezes’ as it picked its way through this. Next I took part in Briony Barr’s ‘Drawing and Undrawing’ workshop. Briony is interested in art that is created by following rules, an interest that is underpinned by her understanding of complexity and systems theories, and the importance to these systems of emergence – those properties that emerge when the rules are being followed by everyone in the space, but according to their own whims and choices. We worked with coloured electrical tape, and created a wonderfully intricate group work on the floor of ArtPlay’s main space. The ‘Undrawing’ part of the workshop involved us making another set of works, by ripping up (“undrawing”) the tape from the floor, and using it to create something else. I created a ball, that I then painstakingly sawed in half with a hacksaw. The interior of my ball looked like a beautifully multi-coloured cabbage. Or perhaps a large colourful crystal. It is now sitting on a shelf in my home. Taking part in other artists’ workshops is a wonderful thing. Not only do you get to engage with their ideas and approaches to practice – which is always inspiring, and gets you thinking about your own processes and choices afresh – you become a learner yourself. You place yourself once again in the hands of someone else, trusting them to guide you, but also aware that you will gain the most from the process by making your own decisions and jumping with both feet into the process, ignoring any lingering reservations you may have. It’s good to feel those moments of vulnerability mixed with anticipation and even excitement – they are a very real part of the workshop experience for many participants. Warm-up activities in workshops and classes serve multiple functions. They help bring the group together into the space with a shared focus, and appropriate energy level for the work we are about to do together. When people arrive in a workshop, they may come in with baggage from the outside world – bad traffic, arguments or tension with others, problems that are hanging around, yet to be solved. They may also bring anxieties about the workshop with them – Will I know anyone? Will everyone be better than me? Will it be too easy/too difficult? I’m shy to play on my own. I’m scared to improvise/sightread/work in a group. ‘Calibrate’ or establish a shared energy level and workshop tone for the session, including moving people towards playful, spontaneous responses that encourage people to remain present and ‘in the moment’, with the inner critics suspended. Warm-ups need to have ‘low-stakes’ outcomes, even when they may require high-level skills to achieve! In this way, the pressure is off. People can relax, and feel free to simply explore and follow their curiosity. This is why games play an essential part of many warm-up routines. I like to include physical elements in my workshop warm-up sequences. Physical warm-ups can do all of the above, but they also get people moving. They draw people out of their heads and into their bodies. They loosen up tight muscles, encourage deeper, more relaxed breathing, and improve posture – all important things to establish when playing music, as the body can be harmed through the repetitive movements and tense focus that can be part of instrumental music-making for some kids. It’s not about physically exhausting people or testing their strength or fitness, but about positive embodied experiences. 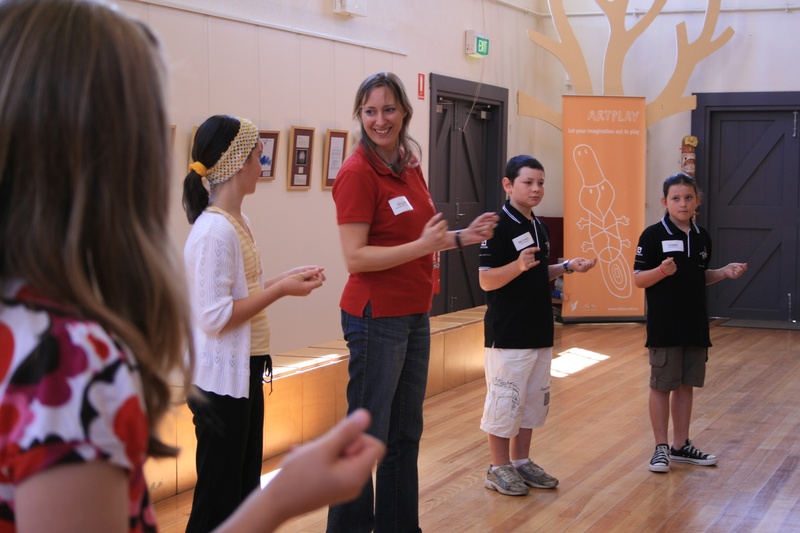 This week I was leading 2-hour music workshops for primary school children as part of ArtPlay and Melbourne Symphony Orchestra’s City Beats program. I needed a succinct warm-up routine, that would lead us into the instrumental music-making early in the session. The following sequence of activities worked really well, moving each group to where I wanted them to be for the creative and collaborative focus of the workshop. Make a circle. Stretch up one arm, high in the air. Stretch out your fingers. Stretch the other arm down, so that you are stretching your arms in opposite directions and feeling it across your body. Take a breath in. Release it together, in a sigh, and shake the arms out. Repeat on the other side of the body. Wriggle the shoulders. Make circles forwards, backwards, and in opposite directions. Wriggle the elbows, the wrists, the rib cage, the stomach (I try to include circles with body parts that I myself am not sure how to execute – just to throw in some fun challenges!). Continue these wriggles, shakes and circles all the way down to the toes – wriggling the toes inside your shoes, and drumming your heels on the floor – with floorboards this makes a satisfying sound. Shift the energy that’s been building into a strong shared focus now. Ask everyone to rock on their feet forwards (towards the toes) and backwards (towards the heels). Some will wobble, lose their balance – but this is a good thing. Ask them to find their ‘edge’ – the edge of their balance at which they still have control over the movement. Next, pour all your weight into one leg. When you do this, it becomes full, and the leg that is empty can float up off the ground. Maintain your balance with this leg in the air. Stretch it out in front of you. Bend it again, then pick up the foot, and place it across your thigh, making a Number 4 shape. Now cross your arms. Now sink down, “sitting in an imaginary chair”. It’s not an easy move, but some kids will be able to do it. For those that wobble, they have another leg to try it on, and now that they know the moves required, their focus will be stronger. They will have a goal. They will also get a good stretch! Next I shift the pace again. We passed a clap around the circle, focusing on speed and strong eye contact (looking in the direction that you are passing the clap to). If the group gets this going well, suggest that they now change the direction of the clap whenever they choose. This builds in a very playful element, as individuals ‘challenge’ each other, and are pushed to remain alert and present. Following this game, the energy is very positive and lifted, and the group has a strong shred focus. We say our names in turn around the circle, repeating each name as it is said. Then we set up a four-beat clapping pattern – Ta Ta (Rest) (Rest) – with the two beats of rest creating a space or silence. I say my name in the first space, the group echoes my name in the next space, then the person on my left says their name in the next space, the group repeats it in the next… and so on, around the whole circle. Each person speaks. Each person is heard. And musician-facilitators in the room get to learn the children’s names. This warm-up routine took about ten minutes and by its conclusion, the groups were always ready to start on their creative collaborative work. It built focus and positive energy, reduced inhibitions and shyness, and established a playful but exacting tone for the work that followed. How do you warm up your groups? Do you start an ensemble rehearsal the same way you might start a creative workshop? Does your warm-up routine establish foundations for the learning session, or simply delineate the session? Do you have any great resources that you turn to again and again? 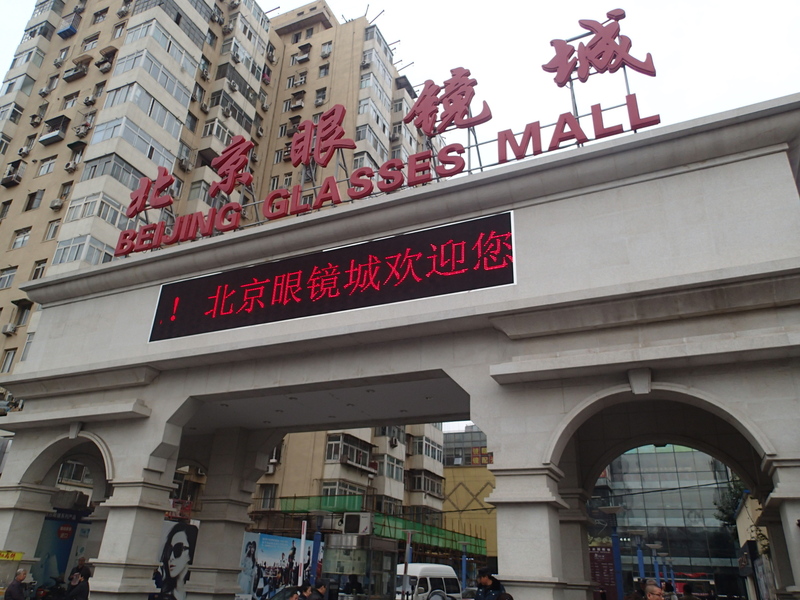 Everyone navigates a new space, adults and children alike. The navigation includes getting to know the physical environment, and negotiating your place within the social setting, working out who you are going to be in this group. It’s true! Adults do it too – when a group of friends goes to a new restaurant or bar, it’s not unusual for people to head to the bathrooms in pairs, and part of the interest is in the experience of checking out the space (friends and I used to note which bars or restaurants we visited that had particularly nice bathrooms!). It’s part of getting familiar with the environment, and yourself within it. 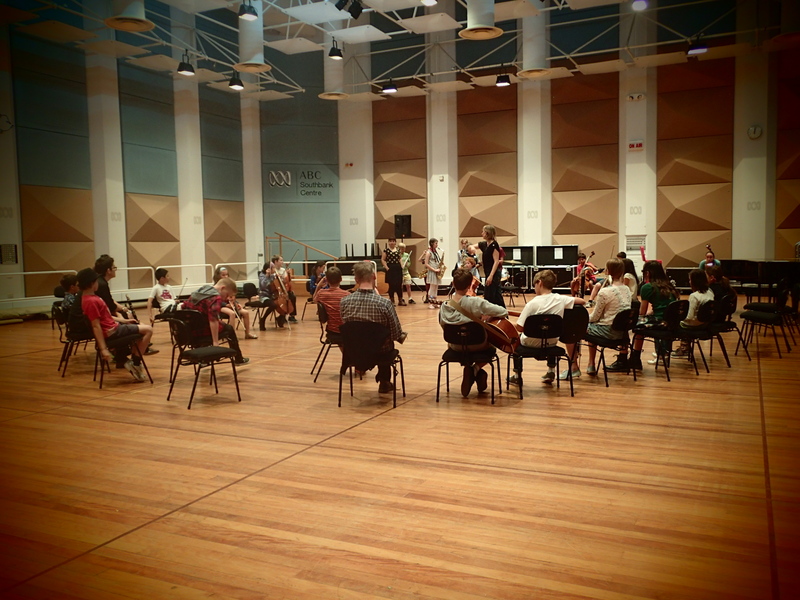 We convened the 2014 MSO ArtPlay Ensemble last week, spending one day working in the Iwaki Auditorium at the ABC Studios, and a second day working at ArtPlay. As they arrived, the children settled into the Green Room. They didn’t know each other yet, and sat quietly. Some read. Some got out their instruments, but if they began to play, it was quietly, unobtrusively. We spent the first 90 minutes engaged in warm-up activities. I wanted to get the group talking, interacting, relaxed and alert in their bodies, and with spontaneous and playful reactions, so that their natural creative faculties would come to the fore early in the process. As we progressed through the warm-up, I watched the children jostle, and joke, take on leadership roles, show initiative, or fall into a required role within the team. With some this happened easily. For others, it was a more puzzling process, as they worked out who they were going to be in this group. One boy, for example, started the warm-up standing next to another boy with a similar cheeky, ‘joker’ energy as his own. They exaggerated every part of the warm-up together, and when we started a movement task, they continued their exaggerations, egging each other on, and not really engaging in the activity itself. At one point, when the group was split up, working across the whole room, I walked over to them, and suggested, smiling but also firm, that they do this one on their own, not with a friend. When we broke into small instrument groups for composing, I put them in two different groups, hoping to give them a chance to continue these negotiations of ‘self in society’ on their own. One of the two settled, but the other seemed to continue his navigations and negotiations. He is a very bright, imaginative young player – he stood out a mile in the Open Workshop selection process. He has impressive technical skills on his instrument too. But he needed to work out who he was in this group. Was he a bright bubbly leader, right-hand man to the MSO musician leading the group, happy to cooperate, and filled with ideas? Was he going to be more in the background? Was he going to be the joker, the ‘silly boy’ who fools around a lot and is a bit disruptive (this type of character doesn’t always find the necessary allies in the MSO ArtPlay Ensemble – most of the kids in the program really love to play music and be part of the ensemble)? No-one could help him figure this out, and I was intrigued by my observations of him. He will find his place, I am sure. He seemed to enjoy himself, and that is the key thing at this point. Sometimes it is so hard to choose. This week I needed to make a Final List of offers for the 2014 MSO ArtPlay Ensemble, a composing and improvising ensemble for 28 children and professional musicians from the Melbourne Symphony Orchestra, working under my direction. We held our annual weekend of try-outs at the start of February. 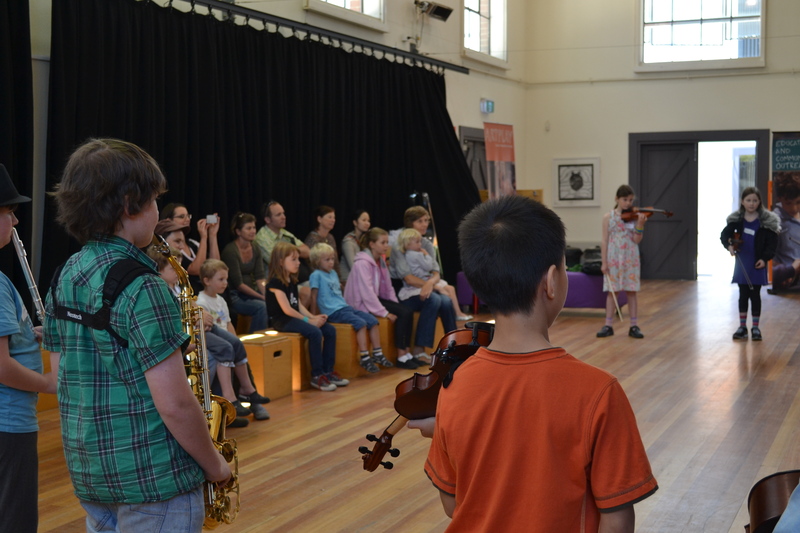 Around 120 children took part in 6 free 1-hour composing workshops. 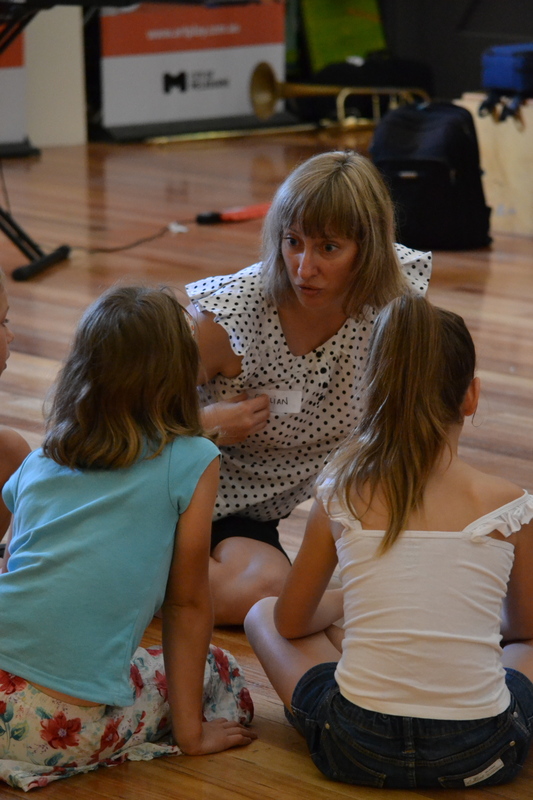 The workshop process is the same each year – it gives children a taste of the strategies we use for collaborative composing in the Ensemble, and shows us who is out there to invite into the Ensemble for 2014. (Read more about the workshop process here). At the end of each workshop, the two MSO musicians and I discuss each participant, noting how they responded and the sorts of strengths and preferences they showed. We look for “bright, sparky kids” – children who like the idea of making things up on their instrument, who are open, who feel comfortable working in a group made up of adults and other children, and who are happy to try out other people’s ideas as well their own. They need to be comfortable on their instrument, but high-level skills are not a primary criterion. We score each child with a Yes, No, Maybe/Yes, or Maybe/No. Usually the Ensemble is made up of children on the ‘Yes’ and ‘Maybe’ lists. Other ‘Maybes’ go on the Reserve list in case someone doesn’t take up their place. By the end of the weekend I had 41 ‘Yeses’. There are only 28 places in the group… I had to take a deep breath, and steel myself to do a Big Cull. It hurt! While it is great that we are attracting so many children who are such a good match for the program, it’s tough to know that there were children – fabulously imaginative, perceptive, inventive kids, with a deep connection to and love for their instrument – who would be awesome contributors to this Ensemble, that I couldn’t offer a place to this year. Choosing is always difficult, especially in an education context, where the goal is one of supporting each child’s development, rather than just finding the best players. There are always children that we see who, for whatever reason – maybe shyness, or self-consciousness with the shift away from notation and right/wrong notes into this inventive and open-ended process – don’t shine as brightly on the day as others but who we believe have great potential and would benefit from participating in the Ensemble. Finding the right balance of personalities, potential, and instrumentation is important. I think the process we use is a good one, and a fair one. There is space for children to come in and just be themselves – every ensemble benefits from a mix of extrovert leaders as well as quieter, rock-steady leaders, and section players. We get a lot of quirky children coming to us – their out-of-the-box thinking is such an asset in creative projects like this, and they often thrive in a social environment with lots of other non-conformist thinkers. Nevertheless, there is no ‘perfect’ choice. The choices I make will create the Ensemble that we get – a different set of choices will create a different Ensemble. By choosing, I am also laying the ground for a set of experiences and relationships for those children, and for me. The first MSO ArtPlay Ensemble was formed in 2006, and that year, there was no selection process. We just accepted everyone who applied. That group is now finishing school, some are even at university. Quite a few have kept in touch over the years, letting me know what they are up to with their music. They are making choices now that will see them becoming the next generation of orchestral musicians, jazz musicians, music therapists – I’m sure. I’m not suggesting those choices are due to their experience of the MSO ArtPlay Ensemble! But I believe that if you experience yourself as musical and creative in your formative playing years, this creates a strong foundation for seeking and trying out new musical ventures as you mature. Being the one to choose is both a privilege and a responsibility, because choices open as well as close… and set new things in motion. Ah well… I’m looking forward to this year’s journey, despite the challenge of choosing! I love this ten minute block. The instruments are arranged around the room, and children and parents can roam freely, trying out all the things they want. I encourage them to try everything that they are curious about, and I bring in some of my favourite things – like crotales, and a spiral cymbal, thumb pianos, dipping gongs, and wah-wah tubes – for them to try. I watched one little girl sit down at the djembe, her mother observing her but leaving her to make her own discoveries. Her little face lit up with excitement as she tapped it the first couple of times. The djembe is quite heavy, so I helped her fasten the waist strap around her back, to make the drum more stable. She began to hit it more boldly. She and her mother exchanged many glances of delight, but mostly, this was her own magical, thrilling experience. It was like she had discovered a new side to herself, as well as a new possibility in the world. It was gorgeous to witness, and an important reminder of just how significant some of these workshop experiences can be for participants. After everyone’s curiousity and exploratory spirit has been sated, we gather to discuss the qualities and characteristics of the sounds that the different instruments make and then everyone sets to work drawing their preferred sound. Not a picture of the instrument, mind, but an image of what you think that sound looks like. Interesting! You learn a lot about how people hear, and what they hear, when they start to draw their sounds. These pictures become part of a giant graphic score – a series of images that depict what we are to play. I stick them up on the wall using blu-tack (in a fairly random, arbitrary order) along a big stretch of wall. Then we play through this first version of the score. Finally, we experiment with structure. We move the individual images around, making decisions about how to begin, how to end, and where to put a few surprises or unexpected moments. The children know about these kinds of musical conventions. They might not know how to name them, but they recognise what we are trying to do and offer all sorts of thoughtful and creative suggestions. The more I move the images around, and follow their instructions and suggestions, the greater ownership they feel over the piece. At the end of the Construction process, we perform the piece from beginning to end, no stopping. This is a workshop for 5-8 year olds, which is not an age group often associated with sitting quietly, instrument in hand, waiting for the right time to play, for extended periods of time. But in this workshop, with the strong visual cues coming from the giant graphic score, they do. The piece usually lasts around 10-12 minutes – no small achievement for these very young players and their parents! After we’d performed our piece and said our good-byes, children came up to me to say thank you, to share a particular experience of the workshop with me, and to collect their pictures from the wall. I love these moments of more personal interaction. I asked one child, “Would you like to take your picture home with you?” She considered this, then asked, “Can I take the blu-tack too?” “Of course you can!” I said, and chuckled a little at the excited expression on her face. We forget, as adults, don’t we? Blu-tack can be just as important as all the other discoveries in a workshop like this.